How do I view a trusted certificate in the Remote Desktop Connection client? I already know how to deal with this, to make the box not appear at every connection ("check Don't ask me again..."). I also know how to make the box reappear after "Don't ask me again" has been checked. (There are several posts to this effect here on superuser.) An option in this dialog allows you to review the server certificate. 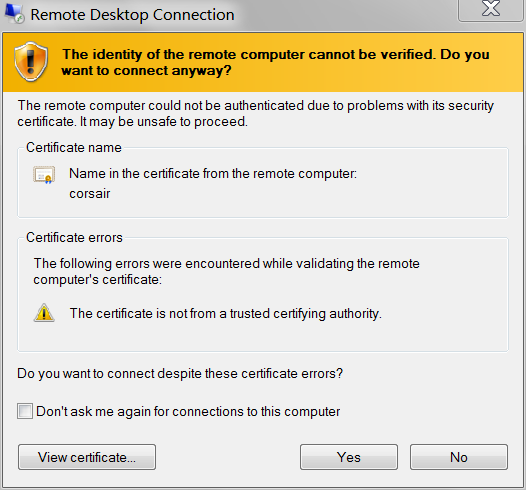 Again, how do I view the certificate used by Remote Desktop Connection when the certificate is valid? EDIT: In my initial testing, I was using a client PC (non-domain) to connect to the server on the same subnet. The security (padlock) icon in MSTSC indicated authentication by kerberos. A subsequent test from a PC on a remote network indicated authentication by server certificate, and gave me the option to view the certificate. So now I am wondering why the local connection authenticated by kerberos and the remote connection by certificate? Kerberos doesn't use certificates. If then connection was secured with Kerberos then there is no certificate to view on this connection. Not the answer you're looking for? Browse other questions tagged remote-desktop or ask your own question. How do I see an old Remote Desktop certificate? RDP - How to block self signed certifcates trusted on client-side by default?